Many of my friends and clients who are transgender, constantly have to decide whether they need to come out. There is the initial coming out to family, friends, work, doctors, therapists and anyone dealing with identity documents. When they meet people as their authentic self, there becomes a question of whether they need to disclose their past. When I met my husband, he had already been transitioned and lived stealth. Upon me coming into his life, with special needs children (especially one with severe emotional problems including lying and manipulation), he suddenly needed to preventatively come out to my children’s therapists, social workers, teachers and sometimes their parents. I am sure it was a big change for him to constantly disclose to those working with my children that he is transgender. Even as a lesbian, living in a heterosexual relationship with my husband who is transgender, there are times I have to decide whether I can come out. I wonder if it is safe to come out and let people see my authentic self. I wonder if it will affect mine or my husband’s employment, friends, relationships and families. Many who are cisgender and straight, don’t understand why we would want to come out, or why there is even a reason to come out. One of the biggest issues is constantly editing your past. If you were raised as a girl and went through girl scouts and a now are a man, you must either be evasive about your past or edit your past if you talk about it. It is so much easier and more relaxing if you can just talk about things without editing or modifying your past to match your current gender. When raising children who do know about your sexuality or transition, there is a struggle. You don’t want your children to blab to everyone about your personal stuff, but at the same time you do not want to tell your children it is a secret or not something to talk about as that makes it shame based. So why not be open all of the time and then you never need to keep coming out? 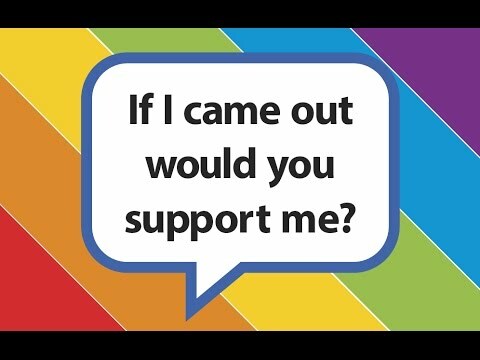 Actually you always have to come out or determine whether you should come out. People automatically assume that people are similar to the majority so they assume you are cisgender, straight and Christian, so you can keep quiet and they usually will keep that assumption unless something else makes them think otherwise or you need to determine if you need to or should come out. Coming out or having to decide to come out is tough. Determining whether someone needs to know the authentic you is often hard and anxiety provoking. You have to trust yourself in knowing the right time, place and way to come out.